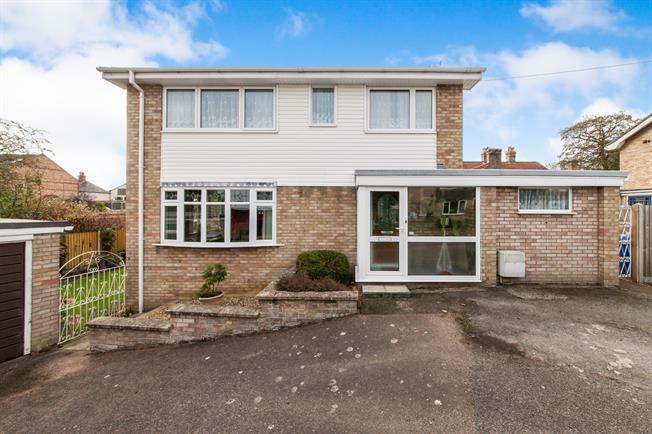 3 Bedroom Detached House For Sale in Bungay for Offers Over £290,000. Tucked away within a private cul-de-sac position and only a short walk from town, this spacious family home also benefits from a driveway and a detached garage. Leading into a welcoming entrance hall, the dual aspect sitting room features two bay windows which allows the natural light to flood into this room. Extended from here through double doors, a study provides additional family accommodation overlooking the garden. The kitchen/dining room is another good size offering space to dine and perfectly placed next to the conservatory which leads onto the decked terrace. The former garage has been replaced with a generously sized utility room, ideal for further storage. Upstairs, all three double bedrooms lead from the landing in addition to the family bathroom. Outside, the driveway to the front allows parking for at least two vehicles and access to the detached garage. The garden to the side and rear features a variety of decked terraces and well maintained beds and borders. Beautifully situated within such a fantastic position and with such generous proportions inside, early viewing is highly recommended!